This spectacular 18 hole golf course is in the Ria Formosa Natural Park and spreads along an almost flat surface of 660.000 m2 down to the Ria Formosa itself, hanging over it and with a stunning view of the sea. 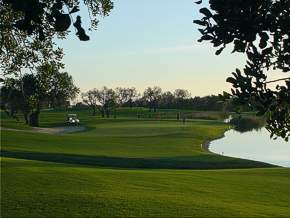 It is a par 72, comprising two loops of 9 holes and each loop with 2 par 5, five par 4 and two par 3 holes. Its total length is about 6.016 meters. Five lakes were strategically built along the course, specifically near greens 5, 10 and 14. Hole 16, par 5, is played between the two biggest lakes. The green of par 3 nr. 17 is limited by one of these lakes where an island with various bird fauna may be found. Besides the beauty the lakes render to the course, they are also used as water reservoirs for the irrigation and are nourished by a stream. Most of the night irrigation water is recovered through drainage, reaching the lakes through an intelligent modulation of the ground. The greens, smoothly undulating, are well protected by bunkers. Greens, tees and fairways are covered with Bent Crenshaw and the roughs with Poa Pretensis with Festuca. 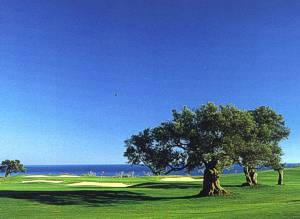 More than 300 trees, such as olive and carob have been transplanted in order to maintain the ancient border of the course and the typical features of the regions landscape. It seems as if the course is of the same age as its centenary trees. From any place in the site, one can see both the mountains and the sea. The surrounding orange trees and vineyards give their contribution to make the course's country landscape even more beautiful. 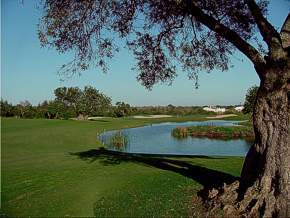 Next to the Quinta da Ria Golf Course is the 18 hole Quinta de Cima Golf Course. The opening par 5 (475 meters) sets the tone for architect Rocky Roquemore's overall design concept with the generous use of visually stunning bunkers. Literally thousands of trees have been introduced to the site - to provide natural hazards between tee and green. A gentle introduction, therefore, until par-3 fifth, which curves like a boomerang around a small lake. Here you can choose from one of two teeing-off positions, although both require a shot over the water to reach the green. The flexibility is in the overall distance - 170 or 115 meters from the Championship tees. The seventh - a par 4 of 357 meters - is stroke index 2 as you stand on the elevated back tee; the potential problems become individually identifiable. The drive is out over a tongue of water from the adjacent lake to a wide, undulating fairway which dips away to the right. The approach is to an elevated, relatively narrow green must carry more of those scattered trees and a deep, kidney shaped bunker protecting it to the front, not to mention the wall of a small, picturesque well which doesn't come into play - until you hit it! The signature hole here is probably the par-4 tenth. At 425 meters you need to be focused. The line looks to be left of center, toward the bunker. Low handicappers may even carry it. But the trees and lie may complicate your second shot, particularly the huge olive tree standing guard to the front of the green. If you favour the wide open space of the fairway, down the right towards the lake, the second shot must take on the water and, while the green is generous in width, it seems to have no depth to it to receive the ball. A memorable hole. The back nine encircle the perimeter of the course and are in complete contrast to those you have just played. The par 4, 333 meter fourteenth is a tough 90 degree dog-leg with an absolute premium on the drive. The second shot to the green must take on an extensive lake. The par 5, 475 meters sixteenth drives out towards an apparently tight landing area but, in fact it's the second shot which must be accurate if it is to land between two stretches of water. Finally the eighteenth, a fabulously wide fairway, but blocked out by the scattered trees to the left strategically placed bunkers await both drive and second shot. Facilities: Club House, Snack bar, Reception, Pro-Shop, Putting-green, Driving-range (300 x 100 m), Golf Academy, Locker rooms, Hire of: Buggies, Pull trolleys, Electric Trolleys, Club Hire.